I had been told she might be in possession of some family papers or information. She sent my dad information a few years ago that she has compiled on all of my cousins and a bit on our family back a generation or two. She also has information on our McElmoyle’s (one tiny piece of paper on this line would be an avalanche compared to what I have already found). As soon as I told her why I was calling she said, “You know I am adopted” and I answered yes I did. What did telling me she was adopted have to do with what her parents had left her – the family papers? We continued talking about the papers and other information, “Have I told you about how we are related to Francis Scott Key?”, about our shared family over a few phone calls from January to March. At some point the conversation turned back to her adoption and she talked to me about her search for her birth family. How, when she and her late husband had gone to Asheville, NC to look into getting a copy of her files she was told, that she wouldn’t be able get her files because there was nothing in her file. Nothing – in – her – file. And so started and ended her search for her birth family. Betty Jean was probably born in Asheville, NC on or about November 5, 1927. She was probably abandoned by one or both of her parents somewhere in the city and ended up as a ward of the state of NC in the care of a Catholic Hospital in Asheville, NC. The information about the Catholic hospital comes from Betty Jean’s adoptive mother. Betty Jean clearly remembers a conversation where her adoptive mother told her that she and her adoptive father picked her up from a Catholic hospital, in Asheville, and that the sister who handed Betty to them told her that Betty’s birth mother had black hair. St. Joseph’s Hospital was the only Catholic Hospital in Asheville, NC in 1927. Run by the Sisters of Mercy. “St. Joseph’s Sanitarium stands out because it was a religiously affiliated facility, operated by a small group of Catholic sisters, in an area where Catholicism was not the predominant religion. St. Joseph’s Sanitarium continued to operate and grow, despite community opposition, until the late 1930s.” Treatment with a Habit: Asheville, Truberculosis and The Sisters of Mercy. The Universtiy of North Carolina at Asheville, A Senior Theses submitted to the department of History in Candidacy For The Degree of Bachelor Arts, by Carol Fronkowiak Jordan, Asheville, North Carolina, November 2004. St.Josephs was one of many Sanitarium’s for Tuberculosis which sprung up in the fresh clean air of the North Carolina mountains in the last part of the 19th and early 20th centuries. My question was why on earth, how on earth would a TB hospital take in a healthy baby? The Sisters of Mercy still operate facilities in NC, so I called and asked them about it. The answer from Sister Maria was, “I have no doubt” that the sisters would have taken a baby in and to their own homes to care for it until suitable parents could be found. Sister Maria has been a part of the Sisters of Mercy for a very long time – she herself is 87. She was officially placed by the court with a family on January 20, 1928 for a period (“indentured to”) prior to the couple being approved for adoption. Betty X’s hopeful new mother, Ethel, wrote to her folks about her new bottle baby who had black hair and blue eyes, telling them that they had picked-her-up on Tuesday. 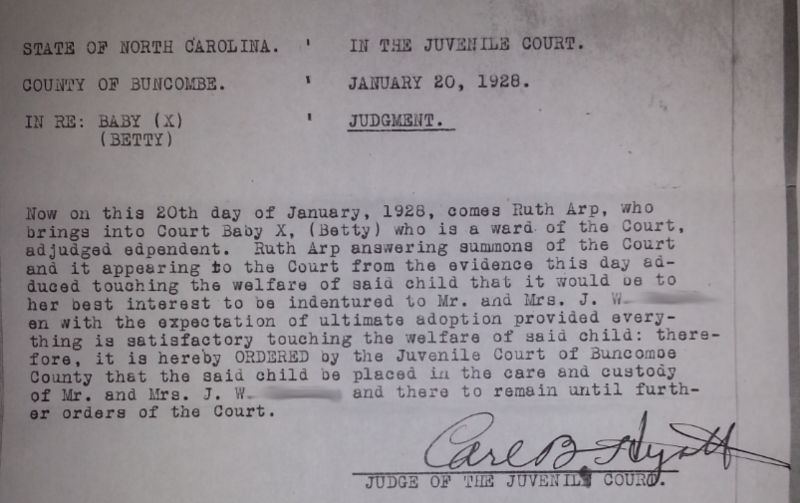 Betty X’s Adoption was finalized on September 5, 1928. After the Buncombe County Juvenile Court Clerk, Ruth Arp, brought her forward to the court. 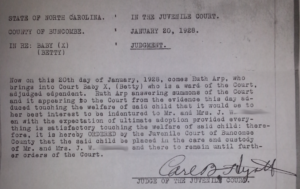 Judge Carl B. Hyatt stated that the child, Betty X, #6437ret, appeared to be 1 year of age. That is it – all Betty Jean has ever known about her birth and adoption. In March of this year, without hesitation, I did what I always do, I jumped in with both feet. I told her that was one of the things I, we, my business, Grandma’s Genes, does. 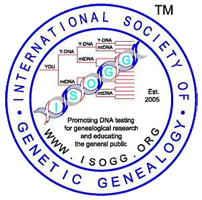 I, we, Grandma’s Genes help birth families find each other using DNA and Genealogy. She agreed to let me help her. A DNA test or five and 8 months later I am ready to tell her how we did what we did and how we figured out who her birth family is. I know, the TV shows make it look like these things happen over night, but for this 90 year old (this week) Adoptee the answers are long overdue.